Hi-Seal 430 2-5/8" x 4-1/8"
Artline Hi-Seal 430 Stamp Pad #3 - Stamp Pad Size: 2-5/8" x 4-1/8"
Artline Hi-Seal stamp pads are filled with industrial ink that are formulated to perform under the harshest conditions encountered in today's manufacturing world. They are also refillable and are perfect for use on all non-porous surfaces. 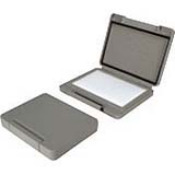 Our Industrial stamp pads use an air-tight lock to ensure a long life or the inking surfaces. **Note: to Consumer: When you receive your stamp pad, it will be (un-inked). With the pad you will also receive a bottle of ink. You will add the ink to your stamp pad until the ink is fully saturated. Allow 15 minutes before using.